In the morning after setting the third tablet, there is a knock at your farmhouse door. Edmond urgently wants you to go with him to the lighthouse and asks if you have heard any stories about how the lighthouse is suppose to bring prosperity to the island. Edmond confirms that the story is true. The lighthouse blessed the island, but a great storm caused the stone tablets to loosen and blow away, causing the lighthouse to lose its light. Without the light from the lighthouse, the entire island began to lose its energy. The storm occurred due to an imbalance in nature, although he doesn't know if the imbalance was a natural occurrence or caused by an unknown force. If all the tablets are not located soon, Edmond warns that the island will sink into the sea! Edmond wants to use the power of the Harvest Goddess Spring to locate the remaining two tablets, but he needs the help of his apprentices. He asks you to repair their houses in Beacon Town so they return to the island. In the northeast corner of the town you'll find Tabitha's House and Gareth's House. Each house require 10 Softwood Lumber, 20 Stone, and 300 G to repair. Once you fix each house, go back to town to see an introduction for Edmond's apprentices, Gareth and Tabitha. The two of them are rivals, although Tabitha seems to have a greater dislike for Gareth, who just finds the witch annoying. After both Gareth and Tabitha have moved back to Beacon Town, Edmond will visit your house in the morning and ask you to meet them at the Harvest Goddess Spring to help them use their powers to locate the last two stone tablets. When you've the time, head to the spring in the mountain to meet up with the three wizards. The two apprentices think they can do it on their own, but Edmond insists that the three of them work together on this task. They all cast the necessary spell to locate the tablets. Edmond determines that one of the tablets is with the Harvest Goddess, but he couldn't locate the other one. He suggests starting with the one that was located, but the other issue is that they don't know where the Harvest Goddess is! If you find anything out, Edmond wants to hear about it. The goddess is a mysterious one and might even be flying around as a bird. Tabitha also says that the beach area south of town is open now too. If you haven't done so already, repair the bridge in the mountain that leads to the red rug-covered house, which requires 600 G, 5 Softwood Lumber, and 5 Stone. The livestock shop repair requires 300 G, 5 Softwood Lumber, and 10 Material Stone to repair. Fixing the bridge and shop will unlock livestock caretakers Sofia, Garbriel, and Michael when you walk back into the mountain area the next day. 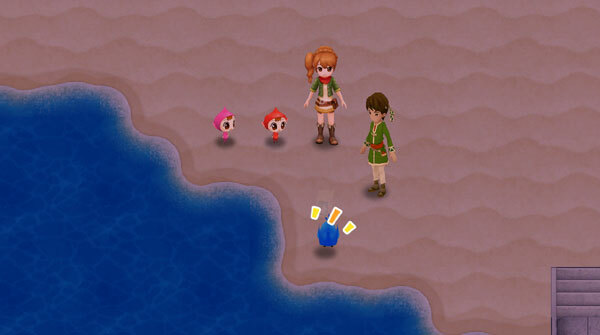 Walk from your farm to the town (after 10am or so) and you'll find a gathering of villagers talking about a Blue Bird at Azure Rock, which is located in the ocean close to the beach. The bird is rumored to come out at night on sunny-weather days. It is good luck to see one! Blossom and Dewy want to see it too and ask that you try and find it for them to see. Blossom will let you know in the morning when you awake if it is a good day to see the bird. That night after 6:00 PM, head to the beach and you'll see a distant rock, but no sign of the legendary Blue Bird (you do NOT need to repair the stone pier to see the bird). Blossom suggests that you talk with someone who knows a lot about animals; that would be Gabriel. Locate the shepherd and ask him about the bird. Gabriel believes it might appear if you put out some Delicious Animal Feed. He teaches you the recipe for the animal food so you can make it in your windmill on your farm. If you haven't repaired the windmill by the animal barn already, you'll need 20 Softwood Lumber, 2 Iron, and 1000 G. The recipe for Delicious Feed is in the second inventory tab of the windmill: 2 Flour and 3 Strawberry (PC version) or 2 Flour, 3 Strawberry, and 2 Milk (Ps4/Switch version). You can make Flour by growing Wheat and then processing 3 Wheat with the windmill to produce 1 Flour. The other option is to repair Bastian's Restaurant in Beacon Town. You'll need to bring 10 Softwood Lumber, 5 Stone, 2 Perch, and 1000 G. The fish can be caught when fishing on your farm or in the mountain. Once you rebuild the restaurant, Bastian and Elise will move back to town. Starting on the next non-Sunday, between 10:00 am and 4:00 pm, Bastian will have cooking ingredients for sale in his shop. Flour can be purchased for 170 G each. Once you have the Delicious Feed, go talk to Gabriel who has been patiently standing next to the mailbox on your farm. He confirms you have the right feed to lure the Blue Bird. After that, head to the beach after 6:00 PM on a clear day to meet him there. Gabriel will set the Delicious Food out on the shore, and a brief moment later a little blue-colored bird appears on Azure Rock. The story is true! Blossom and Calvin are both excited to see the bird, but their ruckus scares the bird away for a second or two before it comes back to eat the food you had set out for it. 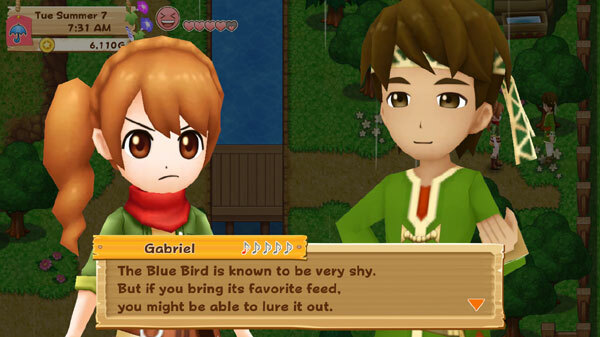 Since Gabriel has a knack for understanding animals, he intently listens to the bird until he reveals that the bird wants to talk to you alone. Since he feels he is in the way, Gabriel leaves you, the Blue Bird, and the invisible-to-him Harvest Sprites on the beach. After Gabriel leaves, the little Blue Bird gives you the apple that had been sitting on Azure Rock. The apple suddenly turns into Woody the Harvest Sprite of trees! Calvin is a bit upset that he almost ate Woody, but the green sprite is okay. Woody is a bit surprised that the Blue Bird was the one who carried him off the rock and asks if you could do him a favor. He wants you to prepare Strawberry Jam and bring it to the Harvest Goddess Spring. If you haven't done so yet, repair Bastian's Restaurant to get the chef and Elise to return to Beacon Town. Walk into the restaurant to see a scene with Elise, who is willing to teach you how to make Strawberry Jam. After waiting for Bastian's lecture about berries, Elise gives you the recipe for your farm house kitchen. You'll also need to go back into the restaurant and buy some Sugar from Bastian's ingredient inventory for 50 G each. Return to your farm house and cook a Strawberry Jam by combining 1 Strawberry and 1 Sugar in your kitchen; you don't need to upgrade your farm house to cook. 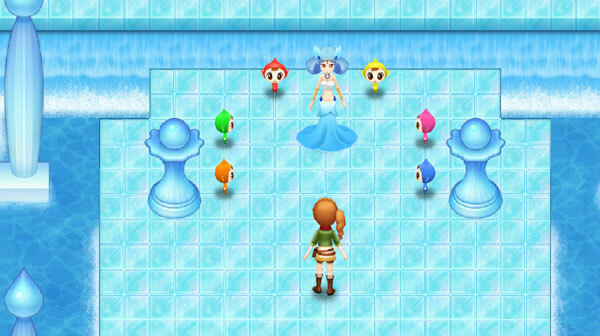 Bring the jam back to the Harvest Goddess Spring in the mountain to meet up with the five Harvest Sprites. The little guys cast a spell on the Strawberry Jam, bringing forth the Blue Bird that turns into the missing Harvest Goddess! Woody remembered that the goddess could turn into the bird when there was trouble, so he used her favorite food to bring her back. The Harvest Goddess knew that the tablets were tied to the lighthouse. She kept one of the blown-away tablets to ensure it didn't fall into the wrong hands. Harvest Goddess also confirms that someone is intentionally causing the storms. After the goddess gives you the fourth tablet, run back to the lighthouse and set it in the panel. 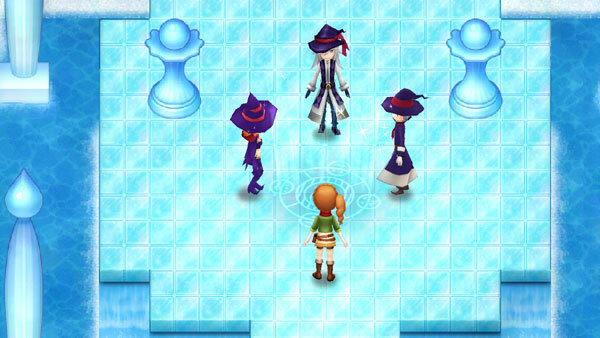 The sprites will combine their powers to activate the stone and light the fourth window.